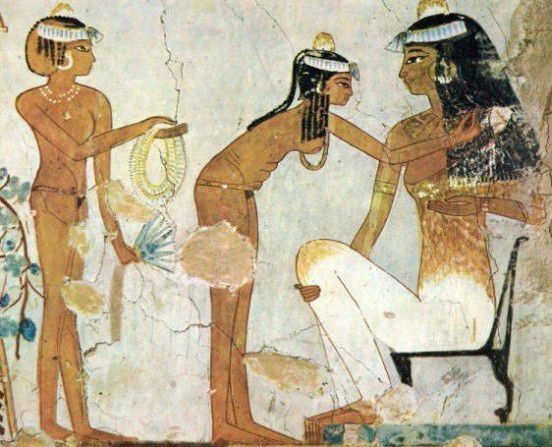 There are documents dating from 2000 BC that mentioned, for the first time, the use of soap for the laundry in the form of paste, made of vegetable oil, clay and ash. Documents from Antiquity mentioned the use of many materials and soapy cleaning agents made from ash and fat. In Europe, the Gallic were the first who made soap from animal fats (goat and wild boar) and ash beech. They used it as a shampoo. Despite a highly developed tradition of bathing, the Romans did adopt a similar product at the second century AD. Actually, on the first century AD, the Roman naturalist, Pliny the Elder, described various forms of hard and soft soaps: the "rutilandis capillis". Women used it to wash and give luster to their hair. In the 8th century, it seems that it is in Aleppo, in northern Syria, that the first hard vegetable based soap olive oil, similar to that which is still used today, has been create. Then, the technique has been transmitted by the Arabs in Spain, Italy and Marseille. Their harbors became the main transit center as well as soap and perfume raw materials used in its manufacture. Soda used at the time came from the ashes obtained by combustion plant as samphire or fern. It is the 13th century that France began producing industrially made soap base, mainly goat tallow and beech ash (alkali). By 1500, the French devised a soap made of olive oil to replace animal fat which was much cheaper. This practice was exported to England, where the production of soap was very successful. However and according to my sources, the privileged classes adopted the soap for personal hygiene in the Middle Ages, but this trend disappeared in the early sixteenth century in favor of perfumes, considered at the time as more effective means of prevention against contagious diseases like the plague. Hygiene timidly reappears at the end of the eighteenth century, still among the upper classes, and scented soaps gradually became fashionable. Then, they quickly discovered that the soap can be produced from fat extracted from many living species: tallow, grease, fish oils and vegetable oils such as coconut oil (coconut), the olive oil, palm oil, soybean oil or corn oil. Soap making was revolutionized in 1791 by the French chemist Nicolas Leblanc, who developed a method to obtain the caustic from the salt soda. With this discovery, they were capable of generating a reaction between sodium hydroxide and fat, producing much more effective soap than the alkali one. In 1783, the Swedish chemist Carl Scheele had boiled olive oil with lead oxide and obtained a substance taste sweet that he called Ölsuss and is now known as the glycerin. In 1823, the French chemist Eugène Chevreul, prompted by this discovery, found out that it is not the fat combined with the alkali that produce soap, but first they are broken down into fatty acids and glycerol. Chevreul is at the origin of the theory of saponification. In the nineteenth century, the soap industry is booming and gradually introduced coconut oil and palm oil in the production. Specialists wrote a study done on a family of 4 and the result showed that they consumed 3 shower gels (150g) and over the same period a bar of soap (100g) would have been enough. So, the soap would be more sustainable in terms consumption and saving.